There were two distinct deigns of Royal Scot 4-6-0, the first of which was a parallel boiler type produced by the North British Locomotive Co. in Glasgow. The second being the rebuilt version, initiated by W.A.Stanier and continued by his successor H.G.Ivatt into BR days, providing tapered boilers and a double blast pipe. The parallel boiler version was introduced on the LMSR in 1927, and were a direct result of the performance of a GWR Castle 4-6-0 on the LMS company’s lines the previous autumn. Fowler’s decision to develop a 4-6-0 resulted in the cancellation of further design work on a compound pacific, anda contract being placed with NBL to supply the new locomotives for the summer of 1927. Despite the assistance of R.E.L. Maunsell of the Southern Railway (a full set of drawings of the SR’s “Lord Nelson” 4-6-0s was made available to North British) the first engines were not in service until the autumn of 1927. Surprisingly perhaps, in view of the haste of its production, the Royal Scot class was a success almost from the word go. This instant improvement enabled the LMS to initiate a daily non-stop working from London Euston to Carlisle, and was a great advance in the company’s express passenger services. Twenty of the locomotives were built in the LMS works at Derby, whilst engine number 46170 was to become the first of the rebuilds, having started life as the ill-fated high-pressure 4-6-0 number 6399, “Fury”. Although 46170 was rebuilt from that tragic compound design in 1935, refinements in the design of the boiler, including an increase in the superheater area, provided the new standard No. 2A boiler. Engines that were rebuilt from 1943 onwards with this tapered boiler achieved even greater success. The rebuilding of the Royal Scots by H.G.Ivatt was extended to include members of the ‘Jubilee’ and ‘Patriot’ classes – the latter being essentially rebuilds of the old LNWR ‘Claughton’ class 4-6-0. That said, not all of the ‘Patriot’ class were rebuilt with the new taper boiler. The front ends of the rebuilt locomotives included double blastpipes and chimneys, drumhead pattern smokebox, and a cast steel supporting saddle with the integral, inside cylinder. Other modifications included new bolster bogies of the ‘De Glehn’ pattern, cast steel axleboxes, and ‘pressed in’ “brasses”. In service the original locomotives had shown themselves capable of some excellent work, and were used on all the prestigious and main line expresses. Until the arrival of the Stanier pacifics, and even afterwards, they could be found on express passenger workings throughout the length of the West Coast Main Line. Following their rebuilding there were many recorded instances of unparalleled excellence, and the characteristics of these engines provided a fitting example of the ultimate in design for a multi cylindered 4-6-0. During the first three years following nationalisation, there were still 25 of the non-rebuilt engines around, and in 1950, most of the North West examples were stabled at Edge Hill. In fact of the 44 Royal Scots at North West depots, 26 were allocated to Liverpool Edge Hill or Manchester Longsight. They continued to be used throughout the 1950s on various principal expresses, including “The Comet”, “The Irish Mail”, “Ulster Express”, “Mid-Day Scot” and others, regularly turning in fine performances. They were, by all accounts, well liked by footplate crews, although by the 1960s their ranks had been drastically pruned, down from 71 to only 10 by 1964. Of these, 7 were found in the North West, with 2 at Holyhead, and 3 at Carlisle. Earlier, some had been transferred from their regular workings on the Western Section to the Midland lines, with the survivors in 1964 allocated to Annesley shed. Sadly none survived more than a year or two, and only 46100 “Royal Scot” and 46115 “Scots Guardsman” lasted to be preserved. 46100 was treated to the LMS express passenger livery of crimson lake, although in its rebuilt form, it would never have carried this colour scheme, but it does do the appearance justice. Interestingly, this locomotive was not rebuilt with its No. 2A boiler until it had been taken into BR ownership and renumbered as 46100, and only received BR livery in that condition. Various members of the class were repainted in BR’s lined black livery for mixed traffic types, my own preference was for the BR standard green livery, lined in orange and black, and carried today by 46115 “Scots Guardsman”. In conclusion it is worth noting that all of the Royal Scots were named, most taking their titles from regiments of the British Army. 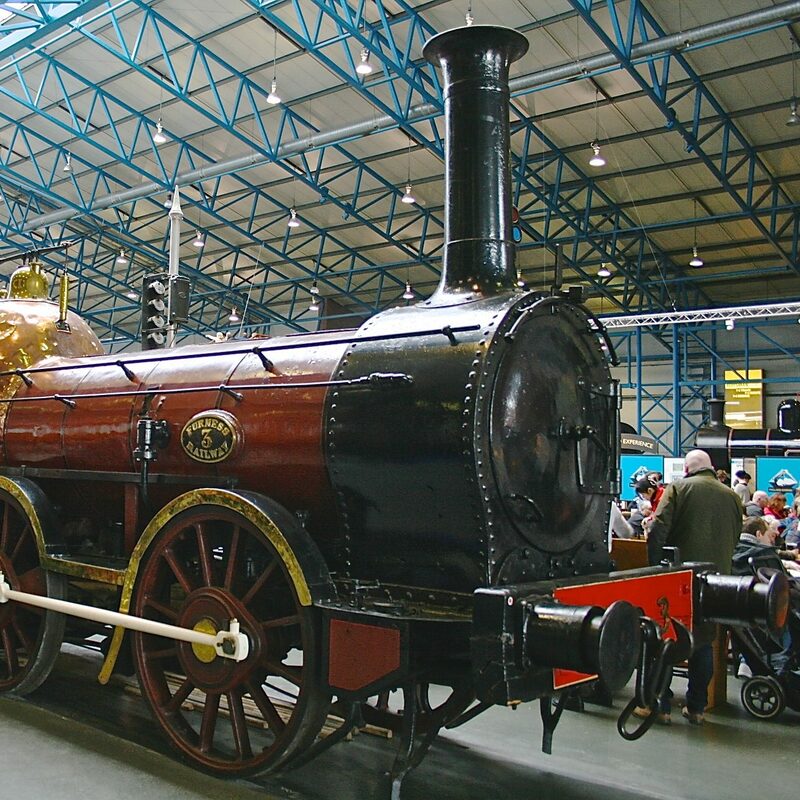 For a number of years, the first unrebuilt locomotives carried names that had previously adorned early LNWR types, such as “Jenny Lind”, and others were renamed on rebuilding. So that 46125, which was originally named “Lancashire Witch” became “3rdCarabinier”. Even after steam traction ended on Britain’s railways, the name “Royal Scot” could still be seen, but carried by the last of the BR electric types – a Class 87, built by GEC Traction. Although nowadays, the fixed formation multiple unit train sets – high-speed or not – does not seem to carry the names as well as the locomotive types. Today, a “Virgin Trains” Pendolino carries the name “City of London” – once carried by an equally famous ex-LMS steam locomotive design – the “Coronation” pacifics – but it’s not the same.